The Trump Five-Year Program is being designed to cut short and replace the current Five-Year Program put in place by the Obama Administration. The new proposal would allow oil and gas companies to purchase leases from 2019 to 2024, and would be devastating to coastal ecosystems and economies around the country. Looking at the map above, you can see that Trump and Zinke see everything as on the table for new oil drilling. This includes Florida, despite a tweet from Interior Secretary, Ryan Zinke, stating that the Sunshine State has been removed from consideration. While Florida may indeed be pulled from the plan at some early stage, a tweet is not a valid legal mechanism for doing anything. If Trump gets what he wants, this program will bring the first new oil leases offshore California since 1984. Much has changed since then. For one thing, we have all become far more aware of the relationship between carbon emissions and catastrophic climate disruption. We have also developed far more robust and reliable renewable sources of energy, making a transition away from polluting fossil fuels not only possible, but essential. What has not changed is that Big Oil continues to play an outsized role in our political system, in our energy production, and in the creation of unfathomable disasters. Here along the Central Coast, residents are all too familiar with the risks posed by offshore oil drilling. Starting with the tragic Santa Barbara Oil Spill of 1969 and all the way through 2015’s Refugio Oil Spill, our communities have experienced devastating spill after spill. We know that with oil and accidents, it is never a question of if, but rather when disaster will strike. Unfortunately, of all the Pacific Region currently included in the Trump proposal, there is no question that the Santa Barbara Channel is the most at risk. And because the era of easy oil is over, we know that new leases off our coast will quickly lead to more than just conventional oil drilling and toward fracking and acidizing. There is too much at stake on our coastline to allow more fracking, acidizing, or other oil drilling technologies. The Santa Barbara Channel is a special place, often referred to as the Galapagos of North America due to its ecological diversity. Not only does the Channel provide excellent opportunities for fisheries, tourism, and other recreation, it also includes the Channel Islands National Marine Sanctuary and Park, as well as federal and state Marine Protected Areas. This area is an important migratory route and feeding area for endangered blue, humpback, and fin whales, southern sea otters, and many other threatened or endangered species. It is also our home, and the site of some of the most beloved and ecologically important coastal open space left in the country. Fortunately, President Trump cannot simply wave a wand and open the doors to new drilling. There is a multi-stage process that is required to finalize a new Five-Year Program. Currently, the Administration has released a Draft Proposed Program, which allows 60 days for the public to comment. That will be followed by a Proposed Program and Draft Programmatic Environmental Impact Statement (PEIS), which will be subject to a 90-day comment period. 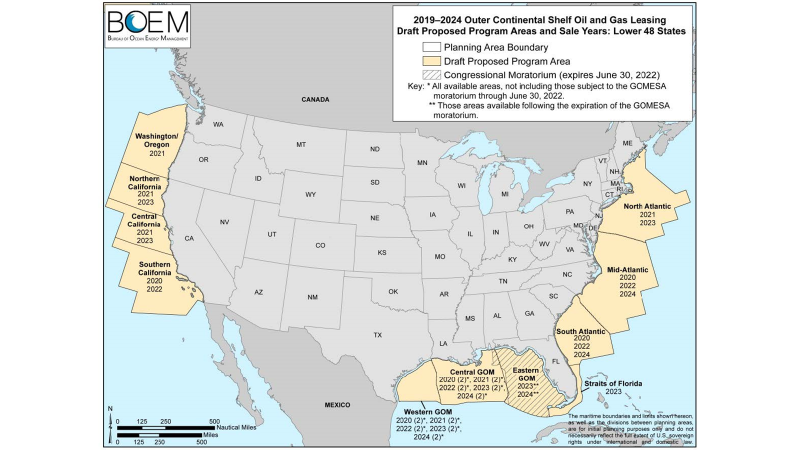 Then the Bureau of Ocean Energy Management (BOEM) will issue a Proposed Final Program and Final PEIS, which will be submitted to the President and Congress for 60 days before it can be finally adopted. While there will be several opportunities for people to weigh in with their concerns and objections over the coming months, this Draft Proposed Program period is critically important. This is our best chance to flood (BOEM with our objections and push to have California’s coast removed from the plan. If you have not yet sent in your comments, please do so today! Visit EDC’s action page where you will see talking points, suggestions, and a link to submit your comments. No more environmental degradation! 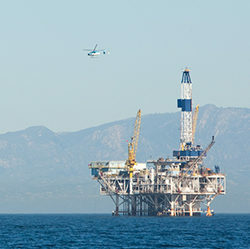 In this day and age, it is inconceivable to even think about putting more oil rigs along the coast. No more pollution! No more carbon emissions! No more money at the expense of our wildlife, environment, and our health.